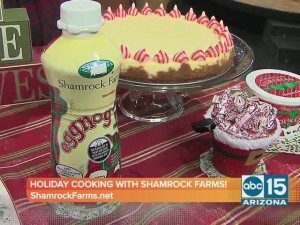 Eggnog peppermint cheesecake anyone? How about an eggnog latte with extract made of rum? Yum! And here is a fun and tasty idea…peppermint eggnog punch for kids of all ages! 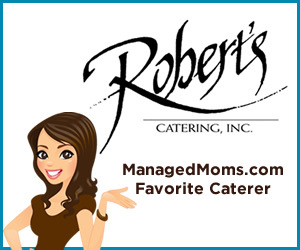 It is all here plus I also share a quick tip that will spice up your mashed potatoes that is super simple. Plus sour cream banana bread and more! With Shamrock Farms fresh dairy foods, the possibilities and recipes are endless! Check out the morning segment I did on the ABC 15’s Sonoran Living morning show this morning for ideas for all of your holiday entertaining. 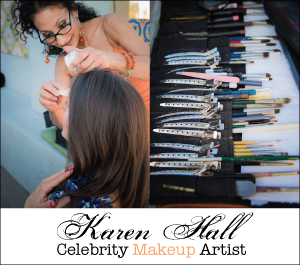 Also a big thank you to professional makeup artist Karen Hall for meeting me at the studio to work her magic on me! And Merry Christmas and Happy Holidays to all! I am proud to work with Shamrock Farms who sponsored this segment.